One of my My Peak Challenges for this year was to “bag my first Munro” i.e. hike my first Scottish Mountain over 3000 feet (~900m). And I did. So: YAY! But… OMG did I underestimate what it would take. I’ve been hiking before, but never at this height. As about 30.000 people each year hike up there I somehow expected it to be a bit more…. manageable? It seems a bit comical in hindsight, that I didn’t expect steep rocky parts to get through. Because…. it’s a freaking >3000 feet mountain! Luckily I at no point actually doubted to have the strength and endurance to make it all the way up and down (I’m sure I have to thank MPC for that in the most part) It didn’t help though, that I got properly soaked on my way back down as the predicted rain had set in after all. My boots weren’t as water proof as I had hoped and I lost the gamble of “only softshell vs softshell + waterproof layer”. The softshell was fine for the occasional drizzle on the way up, but not for the rain on the way down. My own fault. I just hope this won’t lead to me getting sick again like it did the last time I was drenched on my vacation in Brighton in May this year. Back then I stayed in my wet clothes too long though and didn’t take enough rest after. I will definitely take it easy for the next few days. 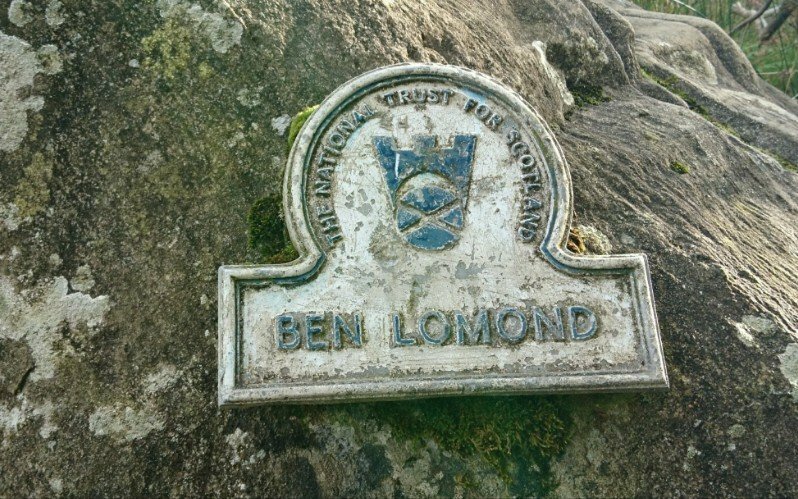 And I don’t want to dwell – in this post or my mind – on the negative things too long, because I bagged my first freaking Munro! YAY! Anyway, this also was a good way to remind me, that it’s not a race! And that it was MY challenge, so I could and should do it at my pace. I don’t have to prove anything to anyone else. Just to myself. That I can do this. And I did! So… yay, again! It was also good to experience or to be reminded that “one step at a time” will get you through almost anything. At least it yesterday got me up a mountain and back down. And back down might have been more challenging – physically and mentally – than going up. And while it was daunting to see how much further I still had to go, it was also very rewarding to turn around and look back all the way I had managed to come already. That goes for both the ways up and down and maybe even for life in general. But I don’t want to be overly philosophical here now. I’m glad and grateful and proud that I was able to experience all of that. To see what I could do. To be reminded that it’s ok to do things at my own pace. To see the beauty of the Highland mountains once more and this time not by having driven up to a view point, but from having hiked up a freaking Munro. To every once in a while stop and notice not just the beauty but also the stillness of it all. So, all in all: Yes it was challenging. But it was worth it! Thank you Sam Heughan for the inspiration, My Peak Challenge (John especially for the training) and all my lovely fellow Peakers whose stories made be believe that I could do this too. Congratulations on bagging your first Munro! A great achievement and you should justifiably be very proud of yourself. Wow! Well done. what an achievement! Well done! I just stumbled across your blog browsing websites for travel inspirations and munro hiking next year. Since I was in the UK for the first time in 1986, England with London in particular had been my only true love until I visited Glasgow and hiked the highlands this summer…. Although I did see a lot, I wasn’t prepared to do a munro on my roadtrip. So that’s on my bucket list for 2018! Hope to reading from your other adventures soon: I really like your blog and the way you’re writing but I’m ashamed to admit that I haven’t heard anything about F. Turner, MPC or Outlander before. However, I alwys like being inspired.